A few months ago, I had the chance to meet the French ethnomusicologist Gilbert Rouget in his apartment in Paris. Rouget joined Paris Musée de l’Homme in 1942 as the assistant to André Schaeffner and was appointed Head of the Ethnomusicology department in 1965. His most famous work is his book “Music and Trance” (“La musique et la transe“), originally published in 1980. Rouget was born in 1916 and turned 101 a few days ago. 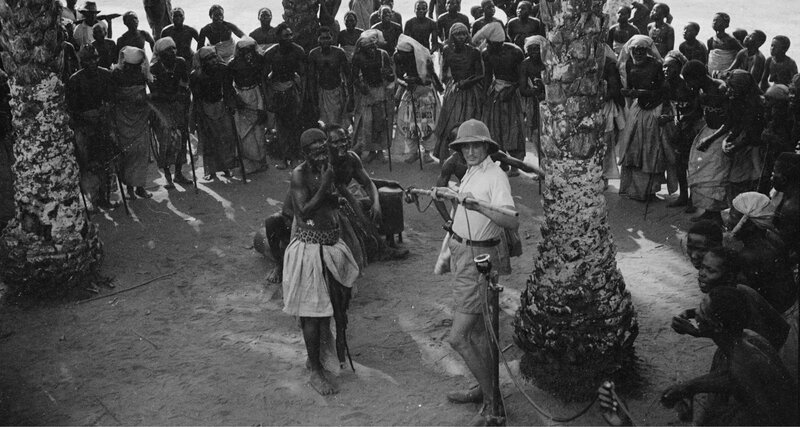 For the occasion, I was invited by the Center for Research in Ethnomusicology – CREM (CNRS – Paris Nanterre University) to curate an online exhibition hosted by the European digital library Europeana on the 1946 Ogooué-Congo ethnographic mission (English and French versions available). Gilbert Rouget was one of the 12 members of this expedition led by French ethnologist Noël Ballif. This exhibition features the complete field recordings collected by Rouget and sound engineer André Didier in the Middle-Congo and Gabon for the Musée de l’Homme, as well as fascinating and previously unreleased photographs. You can read the whole story here. Thanks to Aude Da Cruz-Lima and Josephine Simonnot from the CREM for giving me this great opportunity!